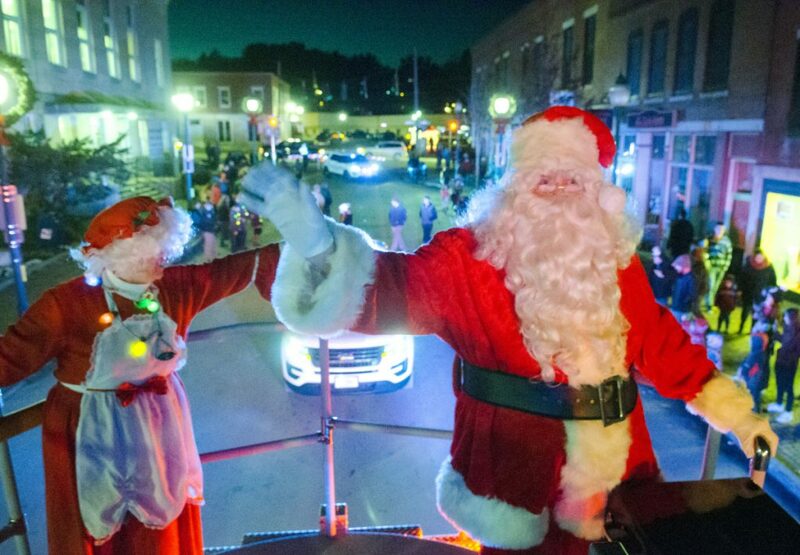 As other communities prepare, Gardiner's festivities draw people from across the region for lights, fun and Santa Claus. GARDINER — Hours before the start of the Gardiner Christmas parade, John Flowers hunted down his wife in the Studio Theater at Johnson Hall. “I had a job to do, and I couldn’t carry it out,” Flowers said. His task was to enter the 50-50 raffle, but he wasn’t carrying any cash. Ellen Flowers and their daughter Elizabeth had been making their way through the historic theater and mulling which of the donated trees at the second annual Festival of Trees fundraiser they would try for. If they were to win one, it would probably be the only holiday decoration at home for the season. 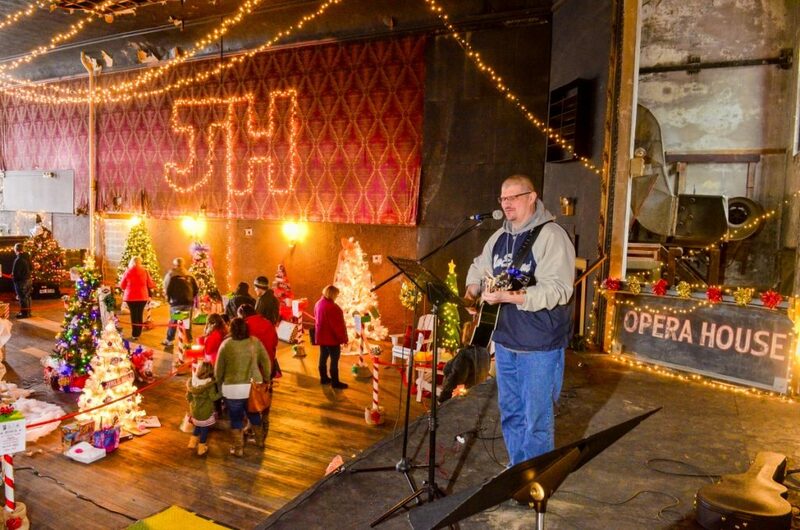 The three-day festival was just one of the events Gardiner officials and volunteers have organized for its annual kickoff of the holiday season. Capping off the celebration was Gardiner’s Parade of Lights, followed the annual tree lighting in Johnson Hall Park. The Flowerses weren’t sure whether they would stay for the parade; they came for a bit of holiday cheer and to hear the live music played by friends of theirs in the upper theater. Gardiner is just one of the central Maine communities to celebrate the season with public events. 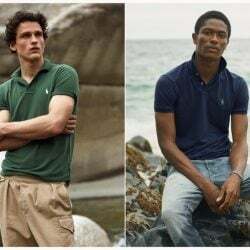 And with each year come a few changes. Adam and Heather Callahan brought their son Landon, now 3, to his second Christmas parade on Saturday, joining the crowds that lined Water Street in downtown Gardiner for the festivities. While Landon liked the floats from area churches and organizations such as the Girl Scouts, the Boy Scouts and the Boys and Girls Club of the Kennebec Valley — and the candy being tossed by parade participants — well enough, it was the flashing lights of the police cars and firetrucks that held his attention. The Callahans first heard about the parade last year, and they said they’ll make it a part of their Christmas season tradition. This year, the Gardiner Christmas tree was lit after the parade; last year it had happened the day before. This year, the Festival of Trees, which raises money for Johnson Hall to help pay for operations and costs associated with theater events such as children’s programming, expanded to include 36 donated trees on three floors and a longer viewing time of two and a half days. 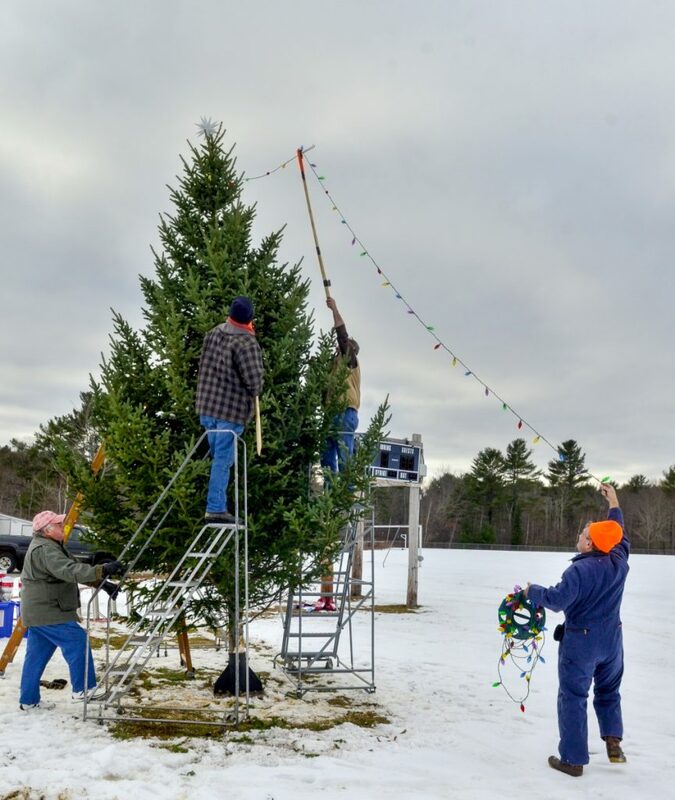 Across the Kennebec River in Chelsea, town officials spent Saturday afternoon working through the logistics of putting a star on top of a donated tree too tall for the assembled ladders and in a field still too soft to bear the weight of a bucket truck. 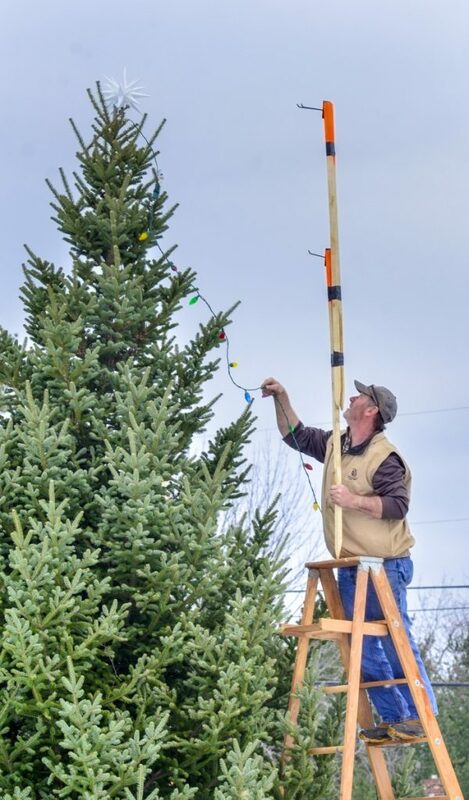 Selectman Michael Pushard first tried lopping off the top with a tree trimmer, but ended up instead using a pole with hooks to set the star. “We pushed it off a week this year,” Pushard said of the town’s holiday event. This weekend, the parking lot of the Chelsea School next to the Town Office was filled with cars of families attending a basketball tournament. 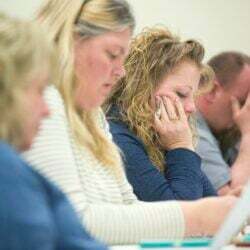 Rather than compete with that, Pushard said, the town coordinated the event with the Parent Teacher Organization so that it would not conflict. 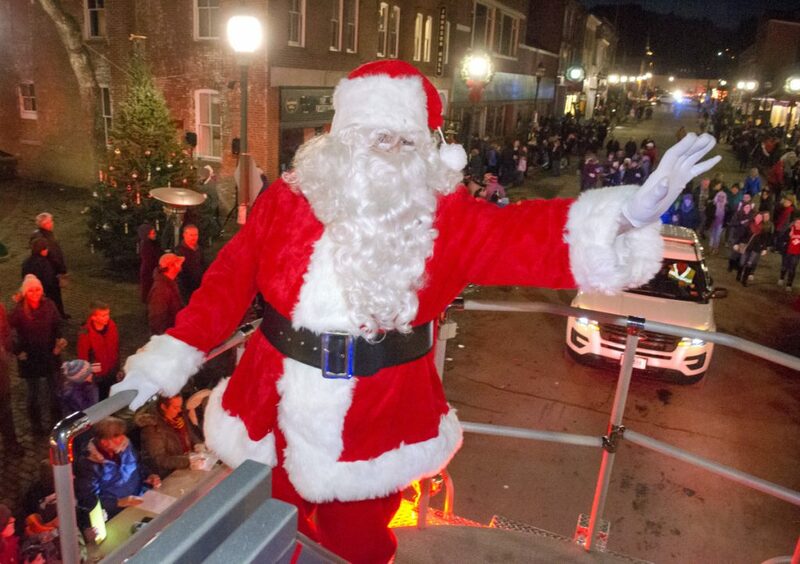 The Christmas season in Chelsea is scheduled to start at 3 p.m. Dec. 8. And in Richmond, the annual Christmas tree lighting will take place Friday at the Waterfront Gazebo; Santa arrives at 5:30 p.m. In Gardiner, holiday events continue Sunday with the annual latke party and Hanukkah celebration at Two Gramps Brewing on Water Street.